Nano Retina has developed a sophisticated and elegant solution intended to restore the sight of people who lost their vision due to retinal degenerative diseases. The miniature Nano Retina device, the NR600 Implant, replaces the functionality of the damaged photoreceptor cells and creates the electrical stimulation required to activate the remaining healthy retinal cells. 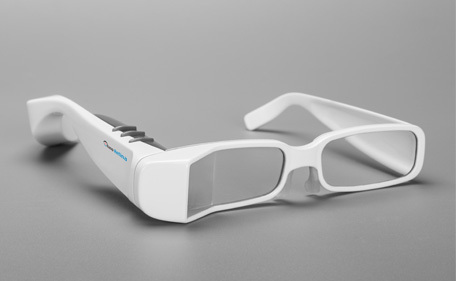 NR600 consists of two components; a miniature implantable chip and a set of eyeglasses worn by the patient. This imager captures the image that is generated at the back of the eye by the natural eye optics. A low power processor translates the image to an electrical stimulation signal that is delivered to the remaining healthy retinal layers using the proprietary 3DNiTM technology. A dense array of hundreds of three dimensional microelectrodes penetrates the healthy retinal layers that originally received the signal from the photoreceptors. 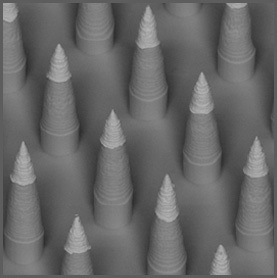 The unique shape and structure of the electrodes enable precise local stimulation of the targeted healthy retinal cells. Photovoltaic elements embedded in the implant generate operating voltage from infra-red laser light, to supply all the required power. The Infra-red laser light is delivered by the Nano Retina eyeglasses. The wireless and rechargeable eyeglasses provide the Nano Retina implant with power, communicate with the implant and allow the patient to fine-tune different light settings at a push of a button. Clinically prime placement of electrodes in place of the damaged photoreceptor cells of the retina where stimulation is crucial. A lower and optimal energy level that is delivered to the area of stimulation resulting in improved safety and higher specificity. 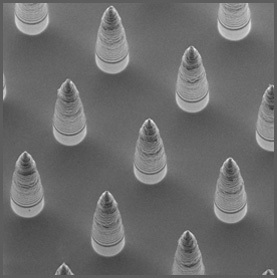 A higher number of active electrodes, closely spaced to each other to provide a higher resolution image. Single, miniature chip implant – enables a standard procedure under local anesthesia, reduced surgical procedure complexity and shorter recovery time. 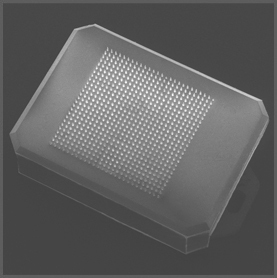 Natural optical pathway – since the image is processed inside the chip, the system uses the normal visual pathway. An image is captured and scanned by eye movement, reducing the requirement to move the head to scan with an external camera. 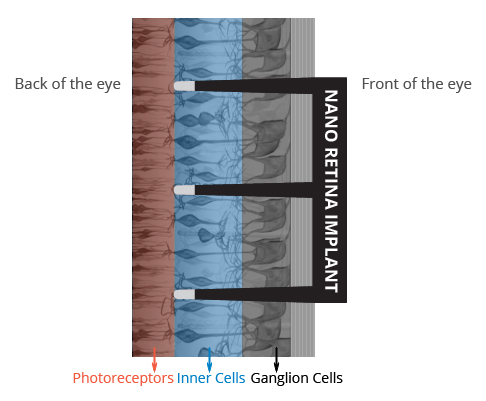 NANO RETINA'S PROPRIETARY 3DNi TECHNOLOGY AND PRODUCTS ARE PROTECTED BY A PORTFOLIO OF ISSUED AND PENDING PATENTS. 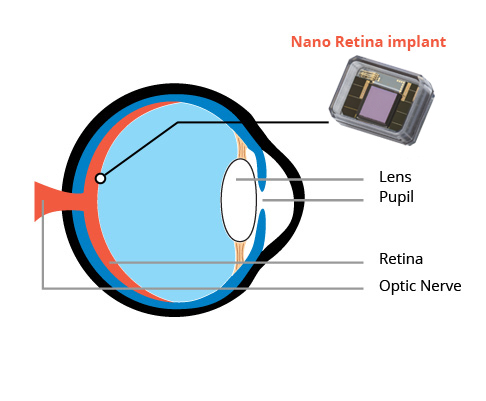 Nano Retina’s implant contains all the required components that enable its full vision functionality in a single miniature chip. The Nano Retina implant is inserted into the eye in a minimally invasive surgical procedure under local anesthesia in an ambulatory surgery with no need for hospitalization. The estimated procedure duration is less than 1 hour. The surgical procedure uses standard ophthalmic surgery methods and preparations up until the final step of the actual deployment of the implant just above the retina. Since the Nano Retina implant contains all the necessary functionalities to stimulate retinal nerves, there is no need for additional wiring outside the eye globe, resulting in a relatively low risk profile for the procedure and a fast healing and recovery time. Following the implantation procedure, the stimulation parameters will be calibrated and optimized based on the patient’s individual needs and a team of low vision specialists will familiarize the patient with his new vision ability. The Nano Retina solution also allows patients to fine-tune different light settings at a push of a button.